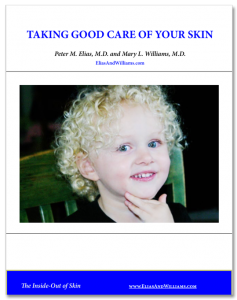 Pollution Affects Skin, Too - Elias and Williams: The Inside-Out of Skin by dermatologists and skin researchers Peter M. Elias, M.D. and Mary L. Williams, M.D. It’s common knowledge that air pollution is bad for our lungs. Individuals with asthma or other chronic lung ailments are particularly vulnerable to its effects. But how often have we thought about the harm that pollution could be doing to our skin? Don’t feel guilty if you haven’t given this much thought, because dermatologists, themselves, have paid little attention to it– at least not until recently, that is. And one thing seems obvious at the outset. Unlike our eyes, which itch and water on days when the pollution index soars, or our lungs which may tighten if we have sensitive lungs – skin gives us no warnings that it is under attack. The effects of pollution on our skin are typically insidious, their onset delayed. Yet, several recent studies have shown that polluted air is bad for the skin. Air pollution increases office visits for acne, and is associated with flares of eczema (atopic dermatitis) in children and the increased prevalence of other eczemas in older adults. Air pollution is also linked to the development of pigmented spots on the face. These dark spots are not premalignant or cancerous, they are common markers of aging skin, and, now we have learned, of chronic exposure to polluted air. How Can Air Pollutants Affect Skin? To understand how this is happening, we need to return to the skin’s ‘permeability’ barrier. Although the primary function of skin, as our readers know, is to prevent the outward escape of water from our body, skin also provides many other barriers. These include barriers to mechanical injury, against the entry of disease-causing microbes, and to the uptake of foreign chemicals (or ‘xenobiotics’) from the environment. This latter barrier is the one at work when skin protects us from injurious chemicals in our polluted environment.This barrier to exogenous chemicals is very robust – but it’s not perfect, as those of us who have experienced outbreaks of poison ivy, poison oak, or poison sumac can attest. We brush against one of these noxious plants and its antigen, ‘urushiol’, makes its way through our stratum corneum. When it reaches deeper in the skin’s layers, it comes into contact with a primed immune system. And we succumb to its itchy, blistery rash. The same barrier system that prevents the outward flow of our body’s water, also blocks the uptake of chemicals from our environment. Because this barrier was primarily designed by evolution to prevent the movement of water, it is most effective against water-loving (‘hydrophilic’) substances. To accomplish this water impermeability, this barrier is made up of fats (‘lipids’). This composition makes it relatively porous to fat-loving (‘lipophilic’), water-hating (‘hydrophobic’) materials – like urushiol. Now, along come factory emissions, automobile exhaust, or smoke from burning wood. This kind of air pollution is composed of small particles (often referred to as ‘particulate matter’ or ‘PM’s). These particles are rich in a class of ‘lipophilic’ molecules, called ‘polycyclic aromatic hydrocarbons’ (or PAHs’). Although much of the particulate matter is too large to penetrate the skin, the fat-friendly PAHs, which coat their surface, can enter the skin. Indeed, in laboratory studies, the application of PAH’s to the skin can induce an eczema-like condition. Ozone is a powerful oxidant. Oxidative damage to cells promotes aging and skin cancer. While skin possesses potent antioxidant defenses, chronic exposure to ozone can deplete these defenses from the stratum corneum, and render us more vulnerable. This newly described link between pollutants and skin aging should not be surprising for dermatologists, as we have recognized for some time the association between cigarette smoking and signs of skin aging. Smokers are well known to develop more skin wrinkling, especially on the face. As skin ages, we have shown that its permeability barrier becomes less competent. 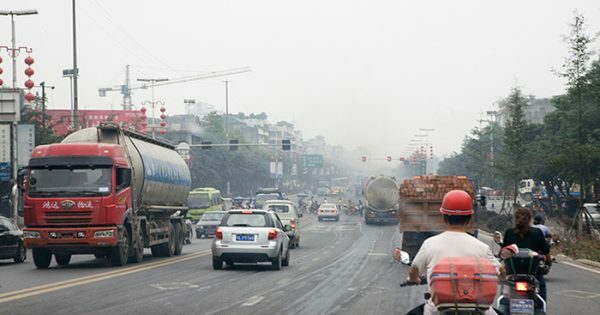 This suggests that air pollution may create a viscous cycle: pollutants promote skin aging and the aging skin’s barrier becomes less capable of keeping out damaging pollutants, which promotes further skin aging. What can we do to protect our skin from air pollution? To retain healthy, youthful skin, we can certainly refrain from polluting our own skin with tobacco smoke. That’s a simple, individual choice. We can also avoid contact with second-hand smoke, which can also damage our skin. In contrast, air pollution is a community problem on a global scale – its harmful effects are hard to avoid. And air pollution globally is inextricably linked to the use of the same carbon-containing fuels that are causing climate change. Taking action here is collective and political, but no less important or necessary for our health and well-being.